That’s enough for the first match, isn’t it? 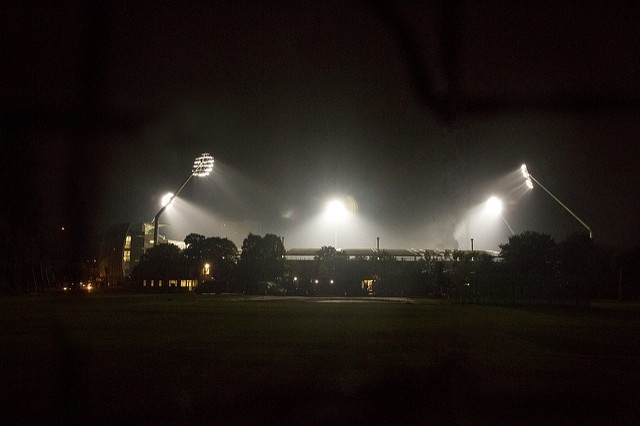 We’d happily pop along to Edgbaston to see what a day-night Test in England is like. The true test (lower-case T) is whether people will keep on going, year after year. So far, day-night Test cricket has been, in the broadest sense, a success. However, as we’ve said before, Britain and the British climate really don’t have all that much in common with the rest of the cricket-playing world. Sometimes you have treat different things as if they’re different. In summer, Britain is somewhat confusingly both colder and lighter than other countries where cricket is played. We can probably put the cold in the ‘cons’ category when debating the merits of day-night Test cricket. If it’s cool at midday, it’s unlikely to be a great deal warmer at 9pm. Fans attending Test matches in the UK are usually keen for more warmth than less. Set against that, British summer evenings are just about the finest thing in the world. On August 17, 2017 – the first day of Edgbaston’s day-night Test – the sun will set at 8.28pm. This ain’t your gone-in-the-blink-of-an-eye tropical sunset either. All it means is the sun’s technically out of view – it won’t go fully dark until the end of ‘astronomical twilight’ at 10.54pm, which is after the day’s play has finished. On a warm, sunny day, Britain’s drawn-out evenings are better than receiving a large shipment of Belgian beer just in time for the weekend. On a cool, damp day, they’re neither here nor there. From this, we conclude that day-night Test cricket will be great when the weather’s good but a bit more rubbish than a day match when it’s not. How this manifests in attendance figures is anyone’s guess, particularly as it’ll take a few years for people to get a feel for things. We have another idea for an attendance-related experiment the ECB could run. They could guarantee Edgbaston the first match of the main Test series of each summer. They could guarantee this for every single year from now on and they could guarantee that the match would always start on a Thursday. According to the ECB’s chief executive, Tom Harrison, the day-night experiment is being conducted in Birmingham because the London grounds are already easy to fill. With that in mind, it makes sense to give Edgbaston every possible advantage – namely, a predictable fixture on a predictable start day. With their greater ability to draw fans, the two London grounds will be able to take Wednesday, Friday and Saturday starts in their stride. We feel pretty sure that after a couple of years, this sort of annual appointment-to-view would result in greatly improved attendances in Birmingham. If so, something similar could be rolled out at Old Trafford, Trent Bridge, Headingley etc. Maybe they could also experiment with ticket prices that didn’t require the prospective purchaser to first remortgage their modest northern dwellingplace to raise the necessary funding. I come here for the cat pictures, I stay for the common sense. I”m well up for this experiment, and will probably go along, but I don’t see how floodlights are going to make much of a difference if the sun sets at 8.28pm. Here’s an idea – they could use a red ball and keep the lights turned off. If it gets a bit murky, turn the lights on. There’s a lot to be said for predictably in the fixture list . Back in the day you knew that there would be tests at Lords, the oval, edgbaston, Trent bridge, headingley and OT. And if memory serves they’d tend to start on Thursday. I don’t remember seeing vast empty swathes of seats at the time. And it cost two bob-a’p’ney to get in! Being further north, the summer evenings are longer in Durham. Followed by a historic Balls-up and some Rash shots. A stumping off a wide too. Is it possible to get patio heaters into the stands at Edgbaston? I feel it’s a key part of the proper British summer evening. Can we not just accept that it is possible to sell out a stadium in a wealthy City where c12M people live within sensible commute distance, whereas it is not possible to do that in Cities where the sensible commute population is 1/10th or 1/20th of that size and the population is also not so wealthy? The more sensible non-London, test match grounds have developed their grounds such that they can be used for lots of other purposes throughout the year in order to make the grounds work financially. I don’t find that problematic. You couldn’t have rock concerts at Lord’s – the locals wouldn’t permit it. But you can do that at Old Trafford and Edgbaston. No problem. The Australian city-based stadium model is also multi-use. Population of each Australian city…oh yeh. We can accept that’s part of the issue. We’re just pointing out there’s more to attendance than that. People seems to be acquiescing to this notion that London Tests are fine and it’s impossible to fill grounds elsewhere, but that’s simplistic. We also wonder how many people are within an hour of Edgbaston. From experience, most people in London aren’t within an hour of Lord’s. Most people who would describe their place of residence as Birmingham are within manageable reach of Edgbaston. Not sure that’s the issue. It’s more that there’s a lot of cricket and tickets are expensive. Many people choose to attend only one international match per season. I’d suggest that some 12M people are within an hour of either Lord’s or The Oval or both. I saw several capybaras today (disappointingly, there doesn’t seem to be an agreed-upon collective noun – a King’s Guard of capybaras?). Also, I learned of the existence of M.S. Dhoni: The Untold Story (IMDB rating 8.4/10). We were going to stick the Dhoni trailer in this week’s Cricket Badger but then it turned out it wasn’t really all that funny so we didn’t bother. It’s all linked back to a volume of cricket thing and an international match not being the ‘occasion’ it was not so long ago, coupled with prices i suspect. Most of my friends resident in the UK in widely spread locations will attend a game over the Summer but likelihood is that they might get to one only. All for trying new things though. What colour ball will they use? Sounds like they’ll be reverting to six Tests a summer when the next broadcasting contract is due. The shortfall will have to be made up somewhere and we’d actually prefer it if it were via the new T20 tournament than another glug of international short format fixtures. Not that we’d prefer to watch the domestic competition. We’d just appreciate international fixtures more if there were fewer of them, and this would be a way of achieving that. Hello. Does anyone have a handy link to that thread on here a while back which got an insane amount of comments? Think it was a load of puns on some subject or other. Might have been two or three years ago. Thanks, it’s for a thing. The top two posts for comments have been Why in blazes do you read this website? and the West Indian cricketer name generator. What constitutes ‘insane’? There are about 40 pages on this site that have had over 50 comments. We’re not going to link to or read all of them without having more to go off. Thanks, it was the West Indian name generator. Great times. PS I interviewed Mark Nicholas while he was waiting for a train. Half way through he shouted out: ‘Hang on, we’re on the wrong platform!’ I didn’t put that bit in. More’s the pity. We’d much prefer to read interviews comprising only moments such as that with all the usual stuff taken out. That’s just a general observation, by the way. We will read your interview now and it will of course be marvellous. Surely the bit you didn’t put in could be a “cricketer spotted”, Sam, as long as you supply the relevant incidentals about the exact station and platform?